From the iconic seven-slot grille to the strong stance, the Renegade is definitely a Jeep® brand vehicle. 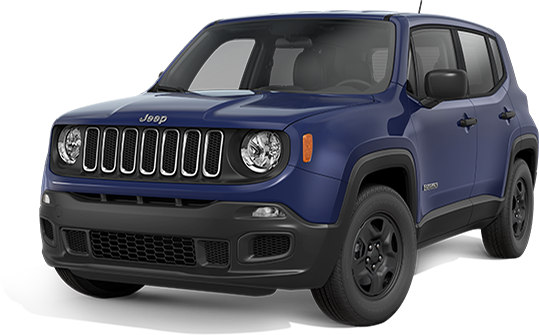 For exploring new trails or heading out on the town, the 2016 Jeep Renegade is ready, willing and able. Disclaimer : Low-mileage lease for well qualified current lessees of a competitive brand vehicle (Non-FCA US LLC). Must show proof of ownership. Based on MSRP example of $24,905.00 with 27A package after all applicable offers. Total due at lease signing $2999 includes a down payment and first month's payment. Offer requires dealer contribution. Tax, title & license extra. Lessee pays for excess wear and mileage of $.25/mile ($0.50/mile for SRT models) for each mile over 10,000 miles per year, if vehicle is returned at end of term. Option to buy at lease end at pre-negotiated price. Dealer's actual terms may vary. Offer through Chrysler Capital. Residency restrictions apply. Must take retail delivery by 05/02/2016. $395 disposition fee due at lease end.